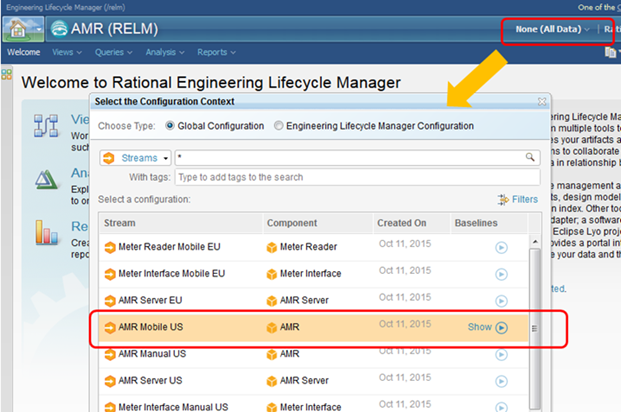 Rational Engineering Lifecycle Manager 6.0.1 "New and Noteworthy"
Rational Engineering Lifecycle Manager is a separately licensed product that you can install with the Collaborative Lifecycle Management solution. The product is included in the CLM Web Installer; it is also included in the IBM Installation Manager CLM repositories. When browsing views, it is now easier to highlight artifacts and relationships. When a node is in focus, its top left corner becomes the center of the zoomed area. When no node is in focus, the top left corner of the view area determines the center of the zoomed area. In complex views, you can easily find the artifacts linked to a specific artifact. Select your focus artifact. Right-click it, and use the Select menu. The menu shows all the linked artifacts by artifact type. When you select a linked artifact from the list, the view adjusts to show the artifact that you selected. When you select a node in a view, the Dependency Analysis menu becomes active in the toolbar. You can set the direction (traversal) that the analysis explores: Downstream, Upstream, Downstream and Upstream and Full Traceability. The analysis includes the artifacts based on your filter selection. To learn about the difference between the Downstream and Upstream and Full Traceability option, read this article. When only specific artifacts are selected or filtered, you can use the Select None, Reset, or Show All buttons to change your selection. You can capture dependency analysis results in snapshots. The snapshot is saved under the original view in the views list. Snapshots can be opened like views. You can share the snapshot of a shared view with other users, or you can set the snapshot to be a personal view. You can use a new set of system artifact elements to create views. The new system artifact elements are the same artifact types that you select in the Report Builder to build your reports. In version 6.0 and in previous versions, artifact elements could be customized by editing SPARQL queries, and by setting properties in the artifact element editor. Now, you can use the system artifact elements as is. No further customization is required. The system artifact elements are available in the view editor, in the Artifact Element (System) section of the palette. Right click a node, and click Edit Node. On the UI Type page, click the pencil icon to edit a parameter. In the Value field, select an attribute from the list. For resolved defects that are not verified, the nodes are filled with yellow color. For resolved defects that are verified, the nodes are filled with green color. The node colors in the view are set based on these conditions. You can use a new set of operators to configure node and connection conditions. These operators make it easier to set conditions flexibly when you configure node definitions. You can now select a configuration context without opening a view associated with a data source with configurations. This way, you can use the same configuration context for several tasks: search, running views, and impact analysis. The icon next to the configuration context menu indicates what configuration type is currently selected. This is the same icon that you see in the application that provides the configuration. 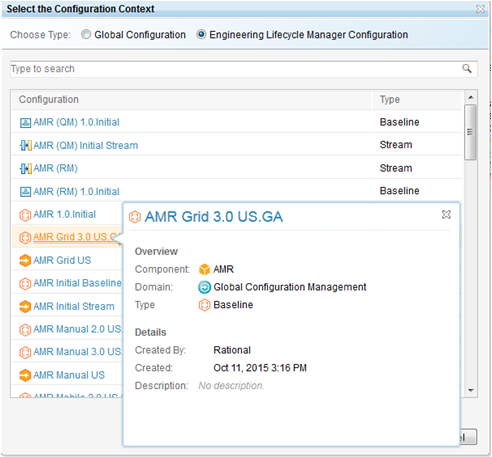 In the Select the configuration context dialog box, each configuration type has a specific icon. Move the cursor over a particular configuration to find more information.